Shell broke the law by not repairing leaks that destroyed the lands of Niger Delta farmers, a Dutch court heard in a case that could set a precedent for global environmental responsibility. The four Nigerian farmers, backed by lobby group Friends of the Earth, have brought the Anglo-Dutch oil giant into court thousands of miles away from their homes with a civil suit that could open the door for hundreds of similar cases. "Shell knew for a long time that the pipeline was damaged but didn't do anything: they could have stopped the leaks," lawyer Channa Samkalden told the court on Thursday, accusing Shell of having "violated its legal obligations". The case relates to damage caused in 2005 and was initially filed in 2008, demanding that Royal Dutch Shell clean up the mess, repair and maintain defective pipelines to prevent further damage and pay out compensation. In a landmark ruling, the Dutch judiciary in 2009 declared itself competent to try the case despite protests from Shell that its Nigerian subsidiary was solely legally responsible for any damage. "I'm here because of the oil leakage that happened in my community in the Shell facilities and destroyed my 47 fish ponds"," Friday Alfred Akpan, from the village of Ikot Ada Udo, told the AFP news agency before heading into court. "The destruction of the fish ponds caused serious damage to me in person and my family because I make use of that fish to take care of myself and my children." Oil pollution has ravaged swathes of the Niger Delta in the world's eighth largest oil producer, which exports more than two million barrels a day. Shell is the biggest producer in the west African country, where it has been drilling for over 50 years. "We believe that the claims are unsubstantiated," Allard Castelein, Shell's Vice President Environment, said at the court. "The spills that happened in the years between 2004 and 2007 all happened as the consequence of illegal theft and sabotage." "We say there was a spill, it wasn't our fault, we cleaned up nevertheless and that's what happened," Castelein said. Environmental groups accuse Shell of double standards and treating spills in Nigeria differently from pollution in Europe or North America. But Castelein fended off the accusations, saying: "We do have the same standards in Europe and Nigeria." He added: "I am not afraid of (the court's) judgment as it will just confirm the way we operate." Shell's lawyer Jan de Bie Leuveling Tjeenk said: "Friends of the Earth believe that this trial will provide a solution to this problem but this is not the case." Friends of the Earth however said the scale of Nigeria's oil pollution was twice that of the five million barrels dumped in the Gulf of Mexico after the explosion on BP's Deepwater Horizon rig in 2010, in the biggest ever marine spill. Shell however disputes the Nigerian figure and puts it much lower. The UN's environmental agency last year released a landmark report, saying decades of oil pollution in the Niger Delta's Ogoniland region may require the world's biggest ever clean-up and could take up to 30 years. Jonathan Verschuuren, an environmental law expert at the Netherlands' Tilburg University, said that a win for the farmers would set a precedent. "If they win the case then it will be an important step that multinationals can more easily be made answerable for the damage they do in developing countries," Verschuuren said. "Until now it's been very tricky because it's difficult to bring cases against these companies in developing countries themselves, because the legislation is often not advanced or properly applied," he said. Environmentalists want the Netherlands, and other Western nations, to pass laws forcing companies to enforce the same environmental responsibility standards abroad as at home. Judges are expected to hand down a ruling within the next six weeks to three months. Shell operates in over 90 countries, according to its website. Al Jazeera's Yvonne Ndege, reporting from Abuja, said the court proceedings are taking place in the Hague because the plaintiffs have "failed to get their case heard within the Nigerian judicial system". Co-plaintiff, Friends of the Earth, blames endemic corruption for the lack of legal action in Nigeria itself. Our correspodent said the Nigerian legal system is full of "hundreds, if not thousands" of similar cases that have never been heard, leaving the plaintiffs with no possibility for compensation. Al Jazeera's Ndege said if the court rules in favour of the plaintiffs it would be a historic step that "basically means the parent companies, often based in the West, in Europe or the United States, will be held responsible for any oil damage and pollution caused by their subsidiaries, wherever they may be". With around 31 million inhabitants, the Niger Delta, which includes the Ogoniland region, is one of the top 10 wetland and coastal marine ecosystems in the world and is a main source of food for the poor, rural population. 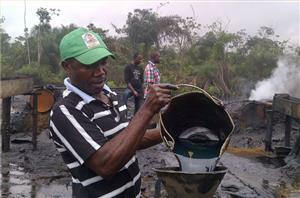 It is not only environmental groups who have been critical of Shell's Nigerian operations.